Perfect for couples, friends, mother/daughter pairings, pamper yourselves at the same time and leave together looking luminous! This facial begins with cleansing and toning, our Norwegian Sea Clay mask, and a shoulder and facial massage with collagen building techniques. We use Tree Froggy organic botanical extracts, vitamin and mineral-enriched serums. This facial brings an instant radiant glow to the skin, leaving it soft and luminous. This is our Norwegian Facial with added steps customized for the client, includes a choose of a vitamin A, C, E, or a Anti-oxidant added in mask to feed skin , High frequency, other light therapies. In this facial, we perform extractions and high frequency light therapy. We use special True organic Performance herbal serums called Tree Froggy to calm inflammation and brighten the skin. It also includes an Kosher activated charcoal mask. This facial reduces redness, inflammation, and helps balance oil in the skin while diminishing blemishes. it will finish off by coated and steaming Pure aloe from the leaf to the skin for Maxim healing power. This facial begins the same as our Norwegian Facial, but uses our Bentonite Clay mask which removes toxins from the pores, reducing inflammation and reducing dark spots. This 30 minute facial consists of our Basic Facial and includes a Vitamin C mask to brighten, hydrate and heal the skin. 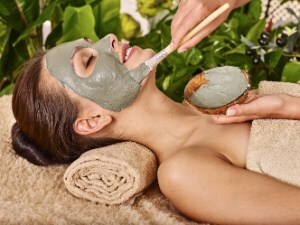 This facial begins with cleansing and toning, our Norwegian Sea Clay mask, and a shoulder and facial massage with collagen building techniques. We use Tree Froggy organic botanical extracts, vitamin and mineral-enriched serums. This facial brings an instant radiant glow to the skin, leaving it soft and luminous. This facial produces hydrating and anti-aging effects. We use anti-aging creams, moisturizing serums, steam on apure collagen mask to refresh and tighten the skin to a Brilliant glow. Light therapies, scraper vibration tool, and galvanic. Chocolate has tons of anti-oxide in a very high level and pure so that the free radicals in the air will not be absorbed into the skin which is the main cause of aging and wrinkles. A chocolate face mask used routinely to moisturize & add complete nutrients. UV Light Protetcting Chocolate has flavonoid compound which is very useful to prevent the skin from bad effect of sun rays of UVA/UVB. Chocolate will release such anti-inflamatory extract to protect the skin from sun rays infection which can trigger some serious skin problems such as cancer and infection.. This Professional grade Chocolate face mask can be also used to fair your skin naturally. Chocolate has much anti-oxide which will stimulate the skin cells to regenerate and reduce the pigment production, of which the main reason why skin looks dark and spotty, working on pigmentation and metabolism inside the skin Perfecting the skin, for a smooth clear look. Professional Kosher activated charcoal works through the chemical process of adsorption. Absorption is the reaction of elements, including nutrients, chemicals and toxins, soaked up and assimilated in the skin or blood stream. Adsorption is the chemical reaction where elements bind to a surface. Lets clean/detox your pores and start fresh with organic Tree Froggy Products. The porous surface of activated charcoal has a negative electric charge that causes positive charged toxins and gas to bond with it. The nooks and crannies in activated charcoal are created through a heating process. It’s important to note that activated charcoal is not charcoal used in your barbecue grill! Professional Kosher Activated charcoal works by trapping toxins and chemicals in its millions of tiny pores. Great for an acne also. This Facial & peppermint chocolate mask contains peppermint, menthol works to brighten up the dull skin, an organic compound with in-house anesthetic properties. Peppermint oil also has antiviral, antibacterial, anti-inflammatory, antispasmodic, and carminative properties.Pale yellow in color, peppermint oil contains omega-3 fatty acids, iron, magnesium, calcium, Vitamins A and C, minerals, potassium, manganese and copper.the combination with chocolate qualities should be part of your skin regiment to maintain a clean, healthy & vibrant glow. Get back your Sparkle! 900. for 3 treatments with a chemical frost peel 3 is recommended. Reduce fine lines under the eyes and around the mouth- treat wrinkles caused by sun damage and aging- improve the appearance of mild scars- treat certain types of acne- reduce age spot, freckles and dark patches due to pregnancy and taking birth control pills. Improve the overall look and feel of your skin giving you a bright appearance.Chemical peels utilize chemical solutions to smooth the texture of your skin, remove pesky blackheads and blemishes while reducing excessive oils that may cause breakouts. $900.00 for 3 treatments with a chemical frost peel 3 is recommended. We have several lighter less evasive peels also. Add on to any facial service. Please let your provider know you would like a Collagen Mask Facial add-on at the start of your visit. A cleanse and toner with Tree Froggy organics then collagen Mask will be steamed while you relax so to get the full benefits and absorption of the collagen. .
Added to our organic wash and mask and moisturizer. Hemp has Tremendous Healing and calming properties on the skin. It is used to cleanse and moisturize the skin. Hemp adds a protective layer to the skin, helps prevent rashes and provides relief for acne. special offer of 45. dollars tax and gratuity not included.regular price $120. Just the right balance of vitamin C serums, washes & masks for this facial you will get maximum skin conditioning benefits. you will have the entire facial regime of organic scrubs, serums and tinctures that we do, plus our True seaweed mask(nothing added just pure seaweed) steamed on for maximum results. This Cold water True seaweed facial filled with the natural softening agents seedweed has an absorbent amount of minerals and vitamins that are found to have instant rejuvenating effects on your skin.